For the last three years, I’ve been saying clean air doesn’t need to cost an arm and a leg. I set up the social enterprise Smart Air to provide low cost purifiers to people in places like China and India to show this. Smart Air co-founder Anna ran a brand new Mi2 in the same 15m2 Smart Air test bedroom where we’ve tested the DIYs, IQ Air, Blue Air, and Philips. Anna ran six tests on auto mode and six tests on the highest setting (which the Xiaomi 2 air purifier oddly calls “Favourites mode”). A Dylos Pro tracked ≥ 0.5 micron and ≥ 2.5 micron particle counts during the test. Test data shows these 0.5 micron readings correlate highly with the US Embassy’s PM2.5 readings (r = .90). As in my earlier tests, I calculated effectiveness as (the number of particles before turning the purifier on) versus (the average number of particles over the last four hours). The Xiaomi purifier scored as one of the worst purifiers I’ve ever tested. On average, it removed only about 60% of 0.5 micron particles over the last 4 hours of the test. Here’s how the Xiaomi results compare to earlier results from other purifiers using the same method, same particle counter, in the same room. That’s worse than the $30 DIY purifier I’ve been showing people how to make for years! Below is a normal test day. I put a dashed red line representing the World Health Organization’s (WHO) 24-hour PM2.5 limit (25 micrograms). What’s wrong? The key is that—even on the highest setting—the Xiaomi reverts back to auto mode after 3 hours. 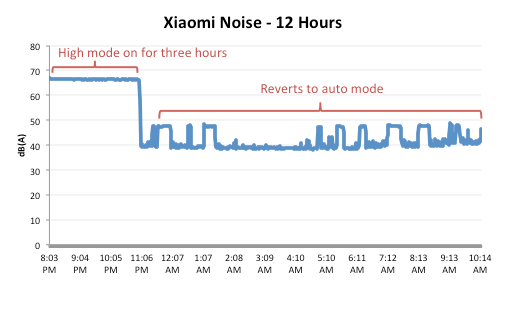 To be sure this is what the machine was doing, we put the Xiaomi on the highest setting and tracked noise levels overnight from the Smart Air Lab. Here is the same graph with particle counts (measured by the Dylos). The particle counts rise every time the machine turns off. The data shows that the Xiaomi has a rather low standard for “safe”. 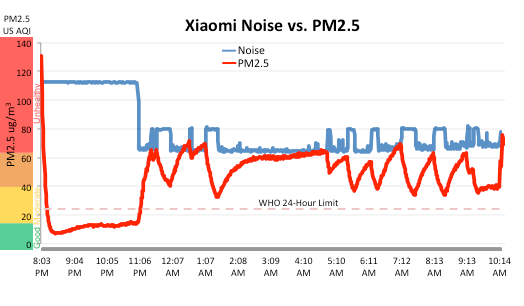 The Xiaomi is turning off when PM2.5 reaches 40 micrograms, which is far higher than even the WHO’s 24 hour limit. Then it turns on again when PM2.5 gets up to 70 micrograms—almost three times the limit. Really? It can’t be kept on high? 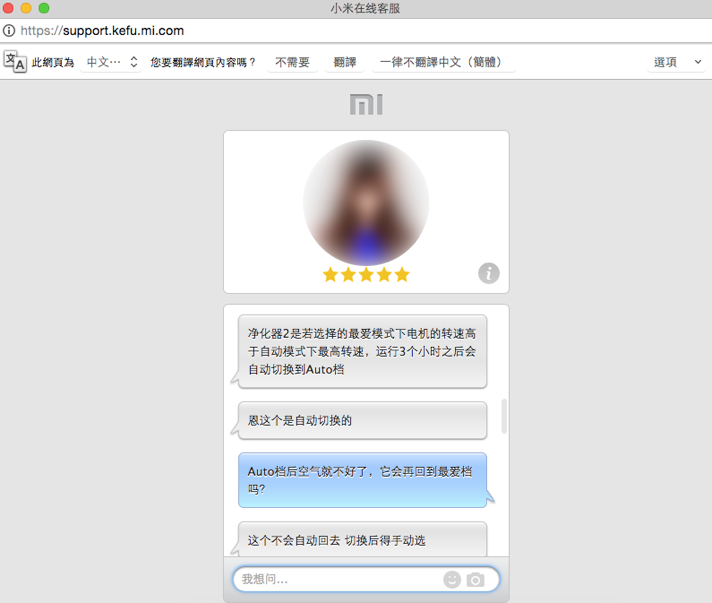 The fact that the Xiaomi air purifier can’t be kept on continuously all night is so strange that Anna asked Xiaomi’s customer service about it twice to make sure we’re not making a mistake. They confirmed that, no matter what, the machine will go back to auto mode after three hours (full transcript available in the supplemental materials). How often is the air unsafe? After the purifier was on for at least 1 hour, for any hour where outdoor air pollution was unsafe (> 25 micrograms – the WHO 24 hour limit), how many hours was indoor air also unsafe (>25 micrograms)? 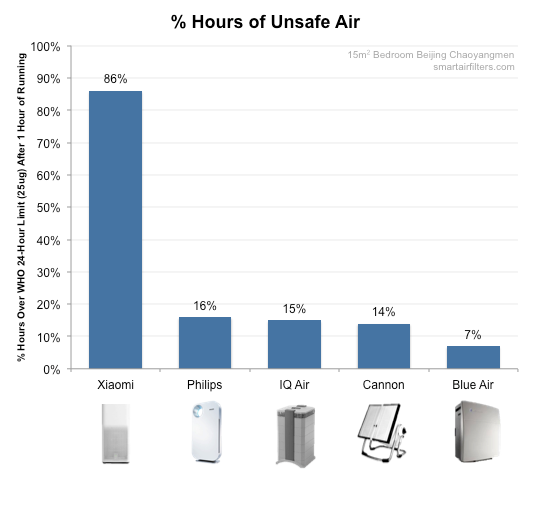 The Xiaomi purifier left air unsafe for a shocking 86% of the time. The other similarly sized machines in my earlier tests left air unsafe only 7-16% of the time. Now perhaps the Xiaomi Mi2’s auto mode is using the looser Chinese standard for clean air of 35 micrograms. Even with that high number, 77% of the hours the Xiaomi Mi2 was running, pollution levels were still above the limit. 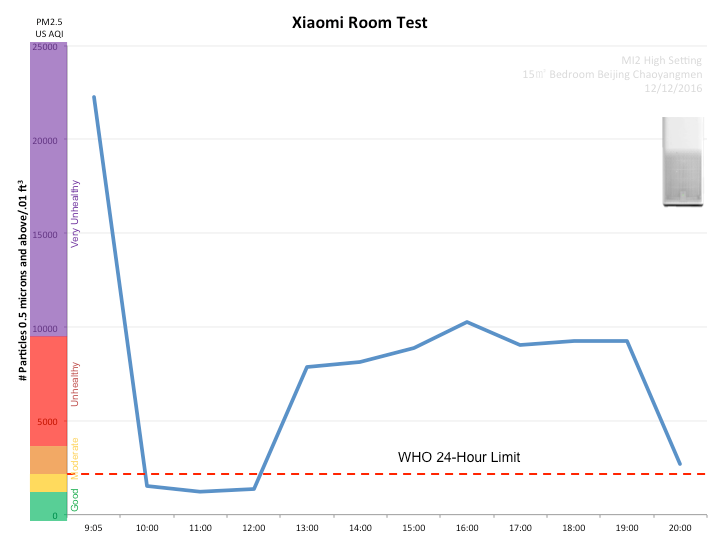 Update: we subsequently ran tests on the particle counter inside the Xiaomi Mi2, and what we found was shocking. Wait, are you sure sure? 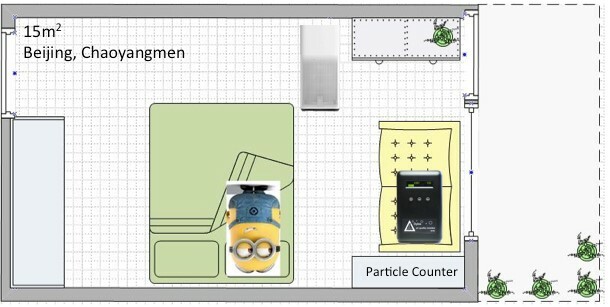 We tested with a different particle counter in a different room. I re-analyzed the data throwing out any days with large fluctuations in outdoor air. I analyzed days when outdoor pollution was low to average (< 150 micrograms). I compared it to other tests done just two weeks before in the exact same room with the exact same particle counter. None of these analyses changed the result (see details here). Note however, that we did only test one Xiaomi Mi2 air purifier, so there is a possibility another machine would perform differently. I invite anyone with a Mi2 to replicate my tests using the same method, and I’m happy to publish the results. From this data, my conclusion is that the fan and the filter are fine, but the Xiaomi air purifier has a programming flaw. Even if I use it on the highest setting, I’ll be breathing air far above the safe limit for most of the night. That’s a problem. Is it just a Xiaomi problem? To be fair, I cannot recommend any auto mode I’ve tested or reviewed. 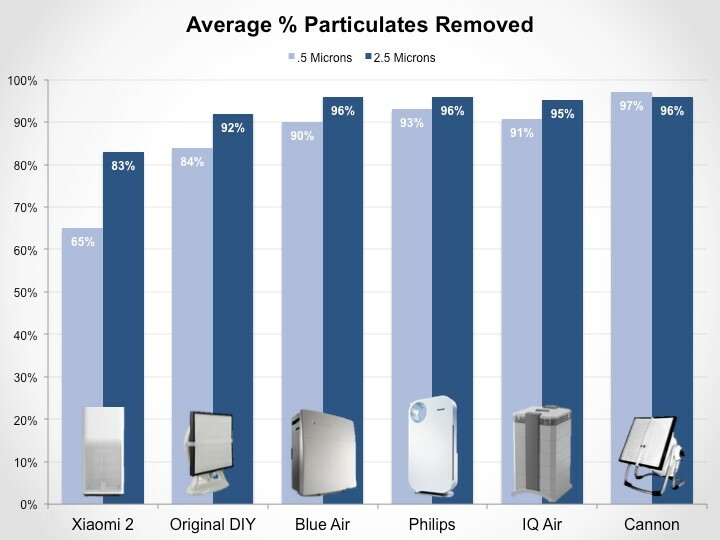 I’ve tested the Philips AC4072 on auto mode, and it averaged 59% reductions in 0.5 micron particles, which is pretty close to the Xiaomi results. 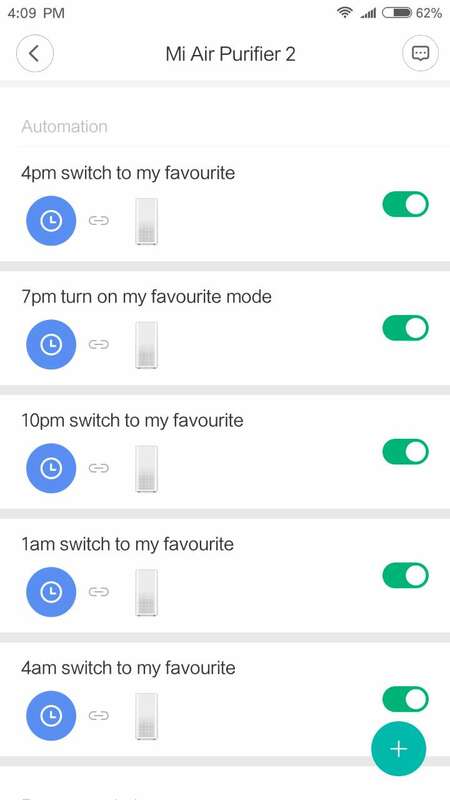 So I think this is more of a problem with auto modes rather than the Xiaomi specifically. Yet I can still recommend the Philips. Why? It can stay in medium or high as long as you want, and my data shows it works fine all night as long as it’s not on auto mode. I’m confident that Xiaomi can fix this flaw by simply allowing people to run it on high without reverting back to auto mode. But until that happens, I cannot give a good review or recommend using the Mi2. As always, I’m publishing more details on the test method and the original data for fellow nerds. Some users have reported that they are able to get their Xiaomi air purifier to remain in ‘high’ mode using the ‘automation’ feature of the app. For more information, check out this comment by Ryan, and this image showing how to set up auto mode. Breath safe! So which air cleaner out there has a functioning auto mode? Right now, none that we’ve tested. We wrote a follow up article to this one explaining why a purifier’s auto mode isn’t reliable. In recent years sole purifiers have been released that case work with standalone particle counters. These might be more reliable, but we don’t have any data on it yet. So it’s either run full time with all the noise, or buy a separate particle monitor and manually turn it on and off? My problem is that I can clean the air in the room, and then the air conditioner/heater just pulls in more dirty air from outside. What we really need is a filter in the AC vent. Anything like this out there? We’ve tested some of the 3M filter paper you can put over air conditioners. We’ve found it works fairly well (but it’s no replacement for an air purifier). You could look into getting that. Huh, really? I thought it pulled in dirty air from outside. It doesn’t? Well that’s good news. Can you send a link or more details for the AC filter paper? I’ve just got a Xiaomi 2S secondhand for ¥500, I’m testing it out right now. The sensor appears as if it has a connection with reality, although too low. My meter says PM 007, it says 001. My meter says PM 042, it says 025. I’ve just set a program on it to turn on above PM 010 and off at PM 003, so we’ll see how it goes. Here’s a link to the 3M AC filter we’ve tested, although the page is only in Chinese. If you search for ‘3M Air Conditioning filter’ you should be able to find some more results! That writeup is for the sensor for the Xiaomi 2. This is the Xiaomi 2S, which has a different sensor. Thanks for the link, I bought the filter paper. The Xiaomi 2S appears to be doing okay. You can’t use the auto mode as the onboard sensor records values much too low and the auto mode’s thresholds are too high. What you can do is go to ‘automation’ and set your own thresholds. I set it to go to ‘favorites’ i.e. high when PM25 reaches 10, and turn back to ‘auto’ at 3. This appears to work. Does the automation work with an iphone or only android? Does this trick work? At what speed do you have it turn on when pm2.5 gets to 10? And it stays at that speed or goes into auto? the model 2 Has poor particle measure sensor. Could you please test again with xiaomi pm2.5 Air detector and use this detector to control the mi air purifier 2 In automatiom mode. Is it will be better or not? Hi Ray, great feedback and thoughts! 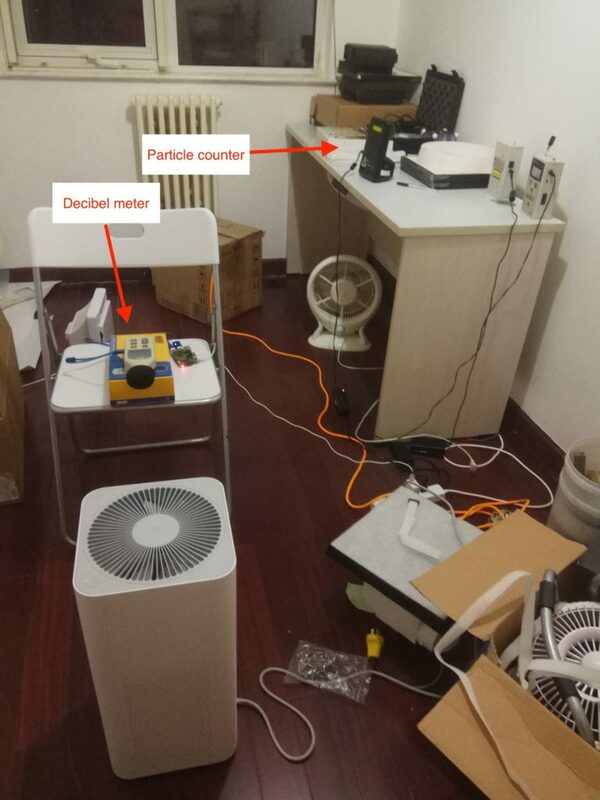 We have tested the 2S built in particle counter, you can read about the Xiaomi Mi 2 air quality monitor tests we did here. What we haven’t tested is the Mi 2S particle counter. We want to get round to testing that soon, so stay tuned! With automation on the app, you can change the thresholds and what they do when when reached. It is not designed to run at full power mode all the time. It will break your machine. The actual problem is that it has insufficient air cleaning power for your environment. You should make your room more air-tight by adding rubber seals on your windows and doors. My room is 30m^3 in Bangkok. And it is more than sufficient for me. The PM2.5 value always below 10 μg/m^3. Sometimes it is even as low as 1 μg/m^3. Only the 2S does not switch back to auto. The PRO always switches back to auto. Don’t get the PRO, get the 2S. Does anyone have information if Xiaomi have plans to change the Chinese standard for clean air to European standard? Changing the location to Europe in the Mi Home app did not affect the criteria when the fan speed should be increased. I am aware that I can automate the process by setting “Switch to My Favorite mode” when the PM2.5 quantity is >25mg/m3 but I was wondering if this is going to be somehow automated by the purifier itself.